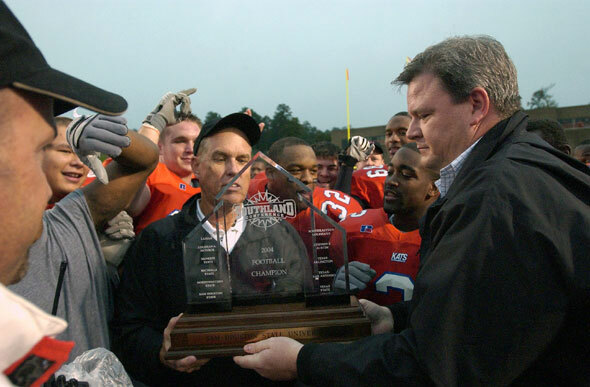 SHSU football coach Ron Randleman accepts the Southland Conference co-championship trophy from Southland Conference commissioner Ron Burnett after Saturday's win over Texas State University -San Marcos. The Bearkats host Western Kentucky at 1 p.m. Saturday in a first round NCAA Division 1-AA playoff game. Riddle for the day. When is a home football game not a "home" game? Answer: When the NCAA "rules." And that is the case for Saturday's 1 p.m. Sam Houston State first round NCAA Division 1-AA playoff game against Western Kentucky. SHSU assistant athletic director Greg Hinze said that according to NCAA football playoff rules there are a number of things the hosting team must do differently. Foremost, probably, since every home team would like the largest crowd possible to enhance its team's chances of winning and advancing, there will be no free admission for students. Students wanting to sit on the west side will need to pay full west side ticket prices. Season ticket holders will have until 5 p.m. Wednesday to obtain their same seats for Saturday's game. There will be no Couch Potato section.
" You can tailgate, etc. but no couch potatoes," said Hinze. "This isn't our call. We would want as many rabid students as possible down there, but this is not our game, this is a NCAA- managed contest." There will be no cannon shots fired.
" We cannot to do this at any playoff games," said Hinze. "We can have the color guard present the colors, etc. but no cannon shots after we score." Sammy and Samantha may be on a sideline rotation schedule, or one selected for spectator seating duty only. A maximum of 12 cheerleaders and/or pompon team members plus one mascot will be allowed for each team. Bands cannot be used to drown out on-field player communication. Bands, or any component thereof, are only allowed to play during timeouts, between games, at halftime, and before and after the competition. Each team's band will have a maximum of six minutes to perform at halftime. If a competing team's band is not available, the time reserved for that band may be used by the other band. The traveling team must inform the host team by noon Wednesday if their band will be available to perform during halftime. Hinze had not heard from Western Kentucky's band by early Monday. The home team can't stack their sideline.No more than 30 sideline passes per team will be issued. Visiting fans will have a section of seats directly behind their team, and home team students or fans will not be allowed to sit in this section.